The 2018 selloff in cryptocurrencies deepened, wiping out about $42 billion of market value over the weekend and extending this year’s slump in Bitcoin to more than 50 percent. Bitcoin has dropped about 12 percent since 5 p.m. New York time on Friday and was trading at $6,756, bringing its decline this year to 53 percent. Most other major virtual currencies also retreated, sending the market value of digital assets tracked by Coinmarketcap.com to a nearly two-month low of $298 billion. At the height of the global crypto-mania in early January, they were worth about $830 billion. Enthusiasm for virtual currencies has waned partly due to a string of cyber heists, including the nearly $500 million theft from Japanese exchange Coincheck Inc. in late January. 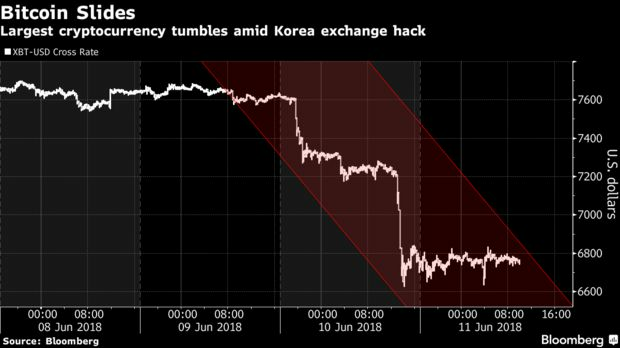 While the latest hacking target — a South Korean venue called Coinrail — is much smaller, the news triggered knee-jerk selling, according to Stephen Innes, head of Asia Pacific trading at Oanda Corp. in Singapore. “This is ‘If it can happen to A, it can happen to B and it can happen to C,’ then people panic because someone is selling,” Innes said. Cryptocurrencies are gaining popularity in the Baltic states where no comprehensive regulations have been introduced yet. Businesses from multiple sectors, including real estate, online trade, the hospitality industry, and even healthcare, are taking advantage of crypto payments. Some companies from the region are already offering their services globally. Cryptocurrencies are becoming more widely accepted in Lithuania, Latvia and Estonia, where buying a cup of coffee with bitcoin is nothing special these days. Cafes, bars, restaurants, hotels, souvenir shops, and even an orthopedic clinic, are now accepting cryptos, according to local media. It seems that the Baltic Tigers of the EU are becoming the “Bitcoin Tigers” of Europe. Crypto payments have been introduced in the real estate business by several companies selling land plots and housing units in the Baltics, Novaya Gazeta reports. Potential buyers will soon be able to purchase land and homes in the Auriai cottage settlement, which is currently under construction not far from Vilnius, the capital of Lithuania. Crypto-priced real estate is also sold in neighboring Latvia and Estonia. The Latvian branch of Baltic Sotheby’s International Realty is offering penthouse apartments in Jūrmala for bitcoin. Recently, the Estonian realtor LAAM Kinnisvara announced it is accepting cryptocurrency for apartments in the town of Maardu, 15 minutes car drive from Tallinn. A third of the 44 units built by the company there have been sold already. The next bitcoin deal is scheduled to take place next week. More than 30 locations in Vilnius accept crypto payments, in Tallinn they are 26, and in Riga – 21, according to Coinmap. Bitcoin ATMs can be found in the capitals of Estonia and Lithuania, according to Coinatmradar. Most of the businesses accepting cryptos are from the hospitality industry – cafes, bars, restaurants, souvenir shops, several hotels. Other sectors, however, are quickly catching up. About a month ago, the United Colors of Benetton franchisee in Lithuania announced it would accept cryptocurrencies. The stores of the fashion brand in Vilnius now take bitcoin, etherium, dash, NEM, and steem through a partnership with Coppay. The Belarus-based payments provider offers instant conversion to fiat at an exchange rate based on data from multiple markets. “Our employees like it because it’s simple and easy. No additional training was needed”, said Arturas Zuokas, co-owner of the company and former mayor of Vilnius. Zerocoin was originally touted as a cryptographic extension to enable fully autonomous cryptocurrency transactions. It was proposed by a team of cryptographers from The John Hopkins University Department of Computer Science, Baltimore. The team included Ian Miers, Christina Garman, Matthew Green and Aviel D. Rubin. The original Zerocoin research paper described it as, “A distributed e-cash system that uses cryptographic techniques to break the link between individual bitcoin transactions without adding trusted parties.” Zerocoin primarily works on two operations, mint and spend. Users can convert the number of digital coins they wish to spend to equivalent zerocoin, and this process is called minting. During the process of minting, each coin is generated using a randomized minting algorithm. The minted coin is allocated a unique serial number which is then released during the spending of the coin. This unique number is validated by the algorithm to prevent double spending using zero-knowledge proofs. Out of the two major flaws highlighted by the paper, the more worrisome one is the denial of spending attack. The unique serial number required to validate zerocoin during spending is a string. Users are required to select a random serial number during initialization. In the event that an attacker gains access to an honest user’s account, they may then be able to select the same serial number of the target instead of selecting a new serial number. The attacker can spend Zerocoins on the network or transfer them to some other account. Given that nodes would have now validated this unique serial number, they will not recognize a second legitimate transaction with the same matching serial number. The plunder of more than $500 million worth of digital coinsfrom the Japanese cryptocurrency exchange Coincheck last week has added to a growing perception that cryptocurrencies are particularly vulnerable to hackers. It’s an expensive reminder that like many things in the cryptocurrency world, security technologies—and the norms, best practices, and rules for using them—are still emerging. Not least because of its enormous size, the Coincheck hack could go down as a seminal moment in that process. This piece first appeared in our new twice-weekly newsletter Chain Letter, which covers the world of blockchain and cryptocurrencies. Sign up here – it’s free! First, hackers laid bare the fact that Coincheck had opted not to implement some basic security measures. The company’s executives told news reporters that the stolen coins had been stored in an internet-connected “hot” wallet. It’s far more secure to keep funds offline, in “cold” storage—often hardware specially designed for the task. Many exchanges already claim in their marketing material that they hold the vast majority of their users’ funds offline. Going forward, this will presumably become standard practice. With that taken care of, there’s a more weighty question on the table. Every public cryptocurrency address is associated with a private key; without it, money can’t be moved from that address. Someone who manages to acquire your private key, though, can send your money away. That’s what happened in the Coincheck heist. So how do we make the private cryptographic keys owners need to access their coins more secure? One answer, known as a multisignature address, is conceptually simple: a “multisig” requires more than one cryptographic key in order execute a transaction. It’s a bit like the multifactor authentication process you may use to access your e-mail account. Business partners can use multisig technology to, for example, create a wallet that requires each of them to sign off on transactions. That would make it substantially more difficult for hackers to access funds. An increasing number of lawyers are taking payment in bitcoin and other cryptocurrencies. With many ICO startups destitute until their crowdsale, ether or tokens are often all they can offer. Rather than turn away business, some lawyers have admitted to taking payment in crypto. While increased acceptance of cryptocurrency – especially in such circles – is to be welcomed, it’s led to concerns that lawyers who are financially invested in a project may struggle to dispense impartial advice. It would be easy to assume that cryptocurrency acceptance in the legal profession is limited to a handful of fringe mavericks and libertarians, but it’s attracted a number of mainstream advocates. A recent article in Law.com (paywalled) quotes several lawyers who now accept crypto including Washington-based lawyer Carol Van Cleef, who helps crypto clients with compliance matters. She explains: “I’ve known for a long time that my opportunity to expand in certain areas has been affected by not taking [cryptocurrency]”. Historically, lawyers who’ve served the poorest and most marginalized members of society have done so for ideological reasons rather than pecuniary gain. In times gone by, it was not unheard of for defense attorneys to take payment in the form of firewood, food or whatever else their clients could spare. Had Breaking Bad been filmed five years later, it’s easy to imagine wheeler-dealer lawyer Saul Goodman accepting crypto and using it to help Walter White account for his vertiginous pallets of $20 bills. As cryptocurrencies have entered the mainstream, their association with illicit activities has diminished, and so has the stigma of accepting them. Lawyers must tread more carefully than professionals from other sectors however and accepting crypto from startups they’re advising raise possible conflict of interest concerns. It’s common practice for cash-strapped startups to offer team members payment in tokens. Everyone from web designers to marketers can be pacified with the promise of tokens as soon as the project launches. Any legal expert entering into such an agreement would be obliged to rule that the token constituted a utility and not a security, as to do otherwise would mean they wouldn’t get paid. Conflict of Interest or Credibility Booster? If a lawyer has never sent or received cryptocurrency, they seem ill-equipped to advise crypto startups on their structuring model. Cryptocurrency theory is all well and good, but to truly appreciate and understand it, proponents insist, it is necessary to experience it in action, and not just once for test purposes, but as part of everyday life. Lawyers who have gotten their hands dirty, so to speak, by using crypto should be able to understand and explain it more effectively than their counterparts who are still crypto virgins. It would be hard to see bitcoin or ethereum acceptance as presenting a conflict of interest; a lawyer taking tokens for the platform they’re advising on, however, would be a much narrower crypto case, and one that is much harder to defend. Mainstream media organizations such as the New York Times forbid their bitcoin reporters from owning cryptocurrency, while other news sites expect their journalists to disclose any potential conflict of interest. While scribes such as the NYT’s Nathaniel Popper have earned praise for the quality of their reporting, it’s hard to shake the feeling that by watching from the sidelines, their reporting is in danger of being too detached. Just as Vietnam war journos had no qualms about hunkering down with the troops, crypto reporters with personal experience of the subject matter are likely to be better informed and more attuned to community matters.